It’s starting to look a little spooky around here. I’ve always enjoyed the holidays and while Christmas is the one I focus the most attention on, I’ve been very excited to have a house to decorate for Halloween too. Our collection of Halloween decor is still small compared to Christmas, but we’re slowly adding to it. 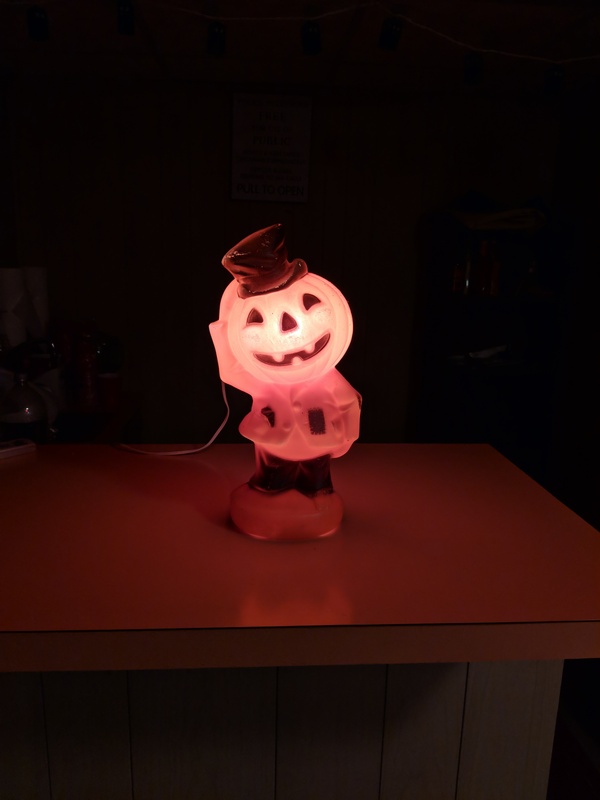 I have a white jack o’ lantern I picked up at a Cracker Barrel years ago that has an orange light bulb that flickers on and off. A couple of different door/wall hanging items, a lantern with a haunted house motif that I swap out for the usual solar lantern on the shepherd’s hook next to the front porch, and a fake tombstone with skull and skeleton arms that’s new this year. You get the idea. How friggin cool is that? Still glows like he’s powered by a nuclear reactor. 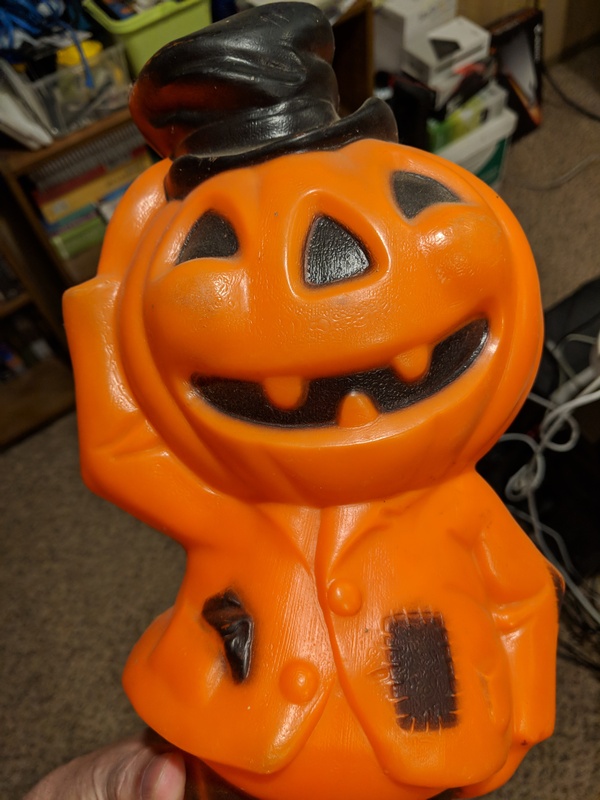 This will be his first Halloween in a couple of decades because he was packed away in boxes that were, until last summer, last stored in my Mother-in-Law’s basement. This will be his year to shine anew. In part because he has a brand new light fixture inside him as the original was lost ages ago. He’s not particularly collectable — the company made tons of them and you can find him on eBay for $15 or less depending on the condition he’s in — but he’s definitely nostalgic for me. The fact that I’ve had him for almost my entire life adds to that. 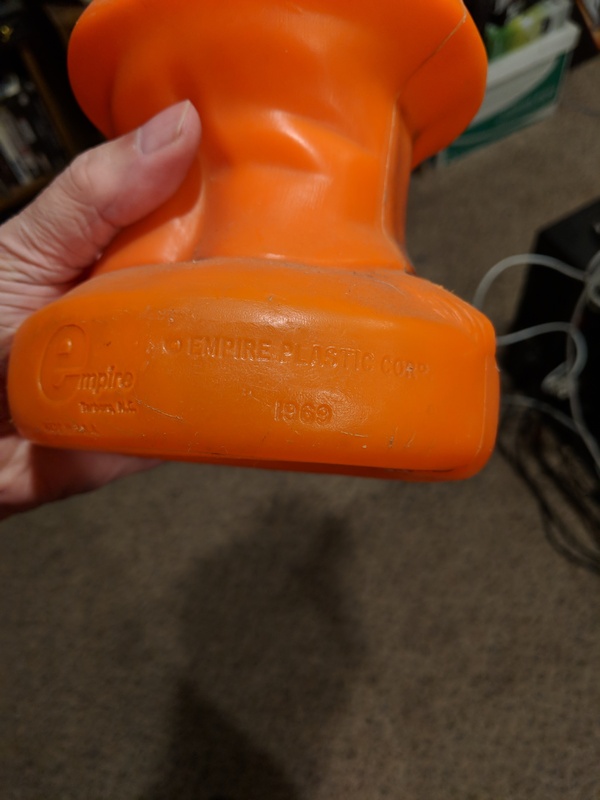 OK, I’m not sure he was “mine” back when I was a kid, but he’s been with me for a long time and I’m putting him back into service. I hope to pick up a fog machine before the big day arrives as well. I used to have one, but forgot to empty it out one year after the evening was over and the fluid gummed it up. I’ve not gotten into the Halloween colored string lights yet as that’s too weirdly close to Christmas decor for me, but I’m softening on it. As I get more stuff put up I’ll probably do another entry with a few more pics. Today’s I’m-Feeling-Old Moment: Kids react to a Walkman. I should really stop following TheFineBros‘ YouTube channel. All it ever does is remind me how old and decrepit I’ve become. Kids these days don’t know how good they got it with their “em-pee-three” doohickeys and their smartass phones. Why in MY day we had to get up to change the damned channel on the TV and we had only three major networks and a couple of minor UHF channels to choose from!